This is the mainstay of my business and has been since December 2000. I invested in the High Reach, Pure Water system in 2004. Back then it was relatively unknown, now it is the industry norm. As I no longer have to use dangerous ladders, my business is fully Health and Safety compliant. With the High Reach system I can comfortably reach windows up to 5 storey from the comfort of the ground. Windows above conservatories which were previously inaccessible can now be reached with ease. The finish of Window Cleaning using this method is far superior to traditional methods as no soap deposits are left behind to attract dirt. Windows cleaned with pure de-ionised water are spotless and sterile. 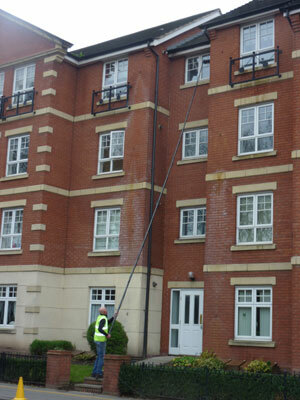 I can and do undertake the Window Cleaning of blocks of flats, commercial buildings and residential care homes, as well as several hundred domestic houses in and around the Worcester, Malvern and Droitwich area. All quotes and advice are free of charge and without any obligation. As a rough guide, a 3-4 bedroom house should cost around £15 - £20.00, Conservatory windows usually add around £5.00 - £10.00 extra to the cost. No one notices clean windows... everyone notices dirty ones.